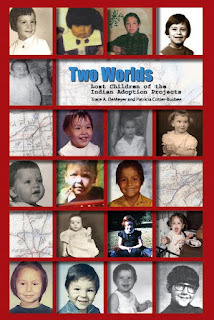 Two Worlds: Lost Children of the Indian Adoption Projects is a new book about the campaign to break indigenous social structures by removing the children: "Governments…paid agencies and churches to remove and Christianize children… and raise them to be non-Indian." 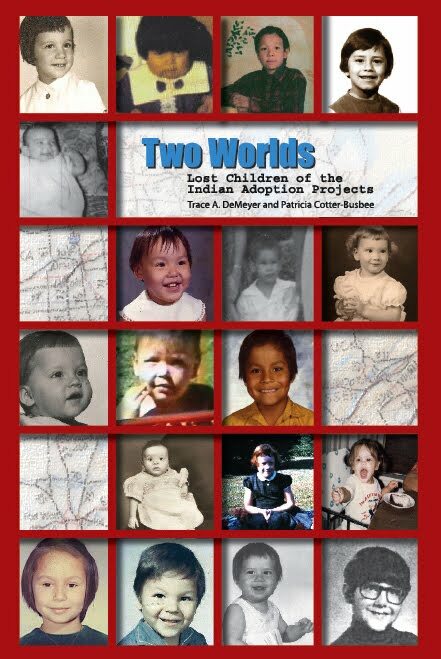 Edited by Trace A. DeMeyer and Patricia Cotter-Busbee, themselves adoptees, the history is told through chronicles by those who lived through it. 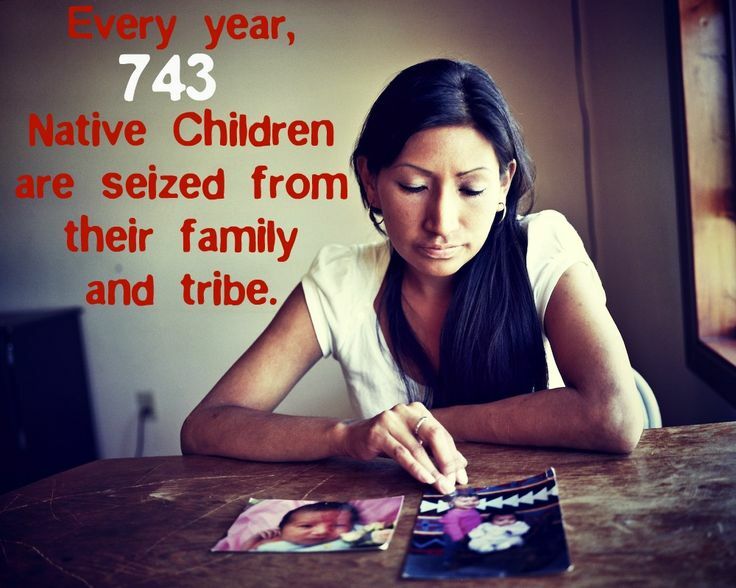 Ethnic cleansing by child removal is a counterpart to the boarding school system, aimed to "kill the Indian and save the man." Boarding schools take children away from home for months and years at a time, returning them as "civilized." 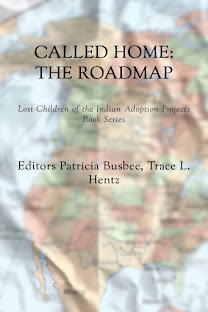 Adoption projects take children away permanently, to assimilate them into non-Indian society via non-Indian families. A common element of the stories is painful curiosity, children trying to figure out who they are, and why their biological parents gave them away. Answers are sometimes never discovered. What is learned may compound the pain, when the child's displacement turns out to be a subchapter in the parent's (or parents') own survival struggle. In many cases, the birth parents' generation was already victimized by the Dawes Act and the Indian wars: one wore the face of "friends of the Indian," the other the face of outright hatred. The "stolen generations" is only part of the trajectory of Indian genocide. Two Worlds shows that the pain of the non-Indian adoptive families often compounds the pain of displacement. For whatever reasons—many are discussed in the multitude of stories—adoptive parents may be trying to escape from their own pain when they take an Indian child into their homes. Those who try a to fill a void or carry out a messianic belief by adopting an Indian child cause pain that multiplies pain; everyone is scarred. Given the fact that thousands of Indian children are adopted out of Indian communities, it is possible—as some adoptee stories show—that a displaced life is not pain-filled. But even in those cases where adoptees live a comfortable life with loving parents, the stories point to an inchoate pain shared by adopted children of any culture: the pain of not knowing one's origins. Adoption agencies exacerbate this by policies of secrecy, as if self-knowledge were a bad thing. As if all this pain were not enough, the stories tell of a whole new world of pain that may open up at the end of the genealogical quest, when the search for the past has led to the present: the pain of re-assimilation; or worse, the pain of not being able to re-assimilate into one's origin community. Sometimes the pain at the end of the quest is caused by absence: the birth parents have passed on. Sometimes it's caused by rejection: the birth parents don't want to revisit their long-ago decision to give away a child, or believe that the reasons for their previous actions are still viable today. Sometimes, it's a mixed bag: one or more biological relatives welcome the returning child, while others spurn the reunion. The variations and permutations are many. They don't fit into neat pigeonholes, though they do show certain patterns. One pattern is the difficulty of re-assimilating not simply to a birth family, but to a birth culture, where language is crucial. As anyone who has learned a foreign language knows, it is easy enough to learn how to make small talk, and much more difficult to learn enough to talk about life (or politics, or spirituality, or anything truly intimate). In these instances, the past remains past, no reunion is possible, and the lost way of life is water under the bridge. 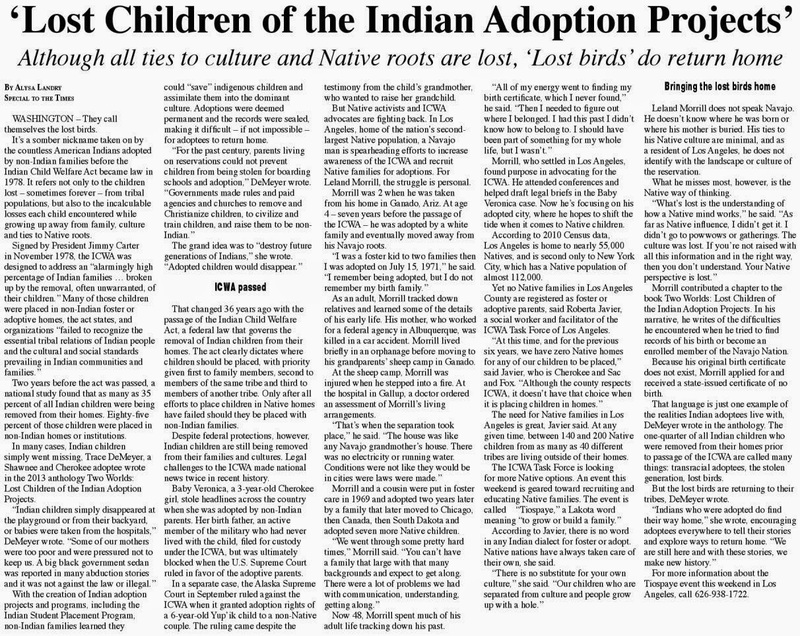 At a hearing in 1974, the Congressional Subcommittee on Indian Affairs learned that in states with large Indian populations, about 25 percent of all American Indian children are taken away from their families by adoption, in addition to the thousands removed into boarding schools. About 85 percent of Indian adoptees were placed in non-Indian homes. By 1978, Congress felt sufficiently concerned to enact the Indian Child Welfare Act. Unfortunately, this legislative response to the genocidal policies of the adoption projects is more honored in the breach than the observance. A 2011 investigation by National Public Radio found that "32 states are failing to abide by the act in one way or another." 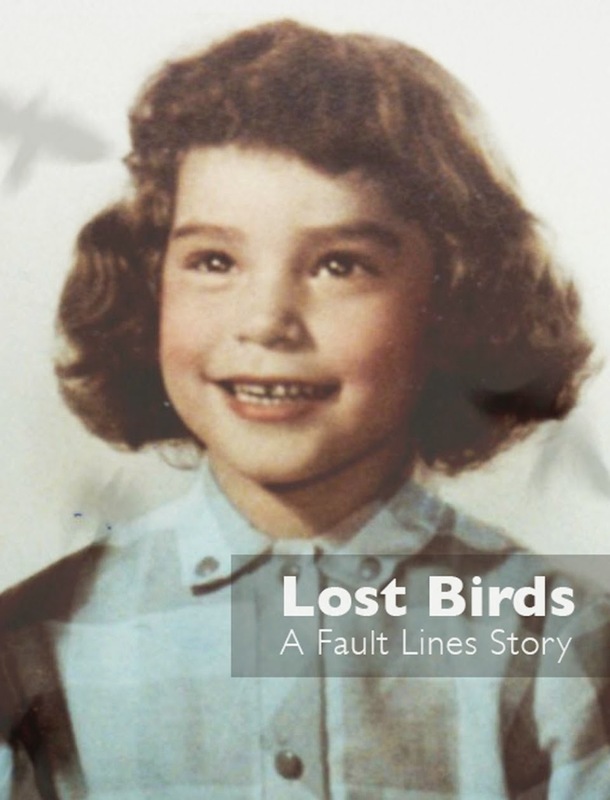 Each of the storytellers in this collection has survived displacement, battles with adoption agencies, the reflected pain of their adoptive and birth parents, and the confusion of not knowing their origins. Many suffered through abuse, self-abuse, and substance abuse, as they struggled through doubts and difficulties of genealogical discovery. The path to discover the past is not easy. The storytellers display courage, commitment, and compassion. The fact that their stories are being replicated today by more stories we have not yet heard is testimony to the ongoing assault on indigenous peoples. Peter d’Errico graduated from Yale Law School in 1968. Staff attorney in Dinebeiina Nahiilna Be Agaditahe Navajo Legal Services, 1968-1970. Taught Legal Studies at University of Massachusetts, Amherst, 1970-2002. 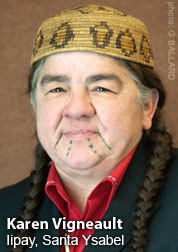 Consulting attorney on indigenous issues.